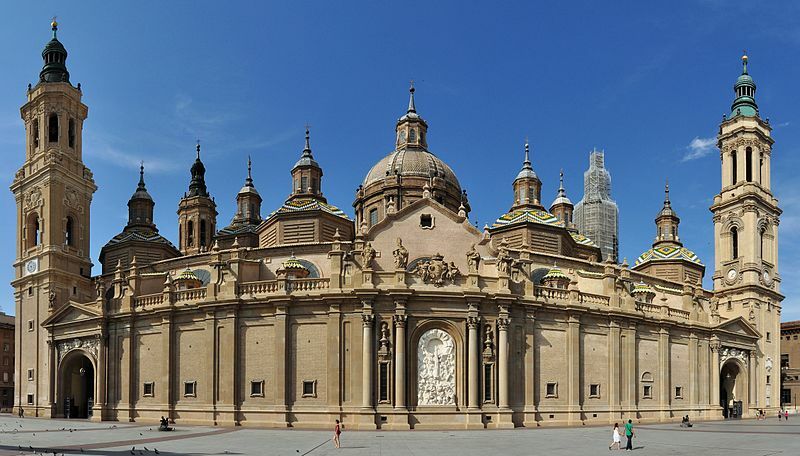 Cathedral Pilar – a visit to both of Zaragoza’s Cathedrals is a must for any tourist. 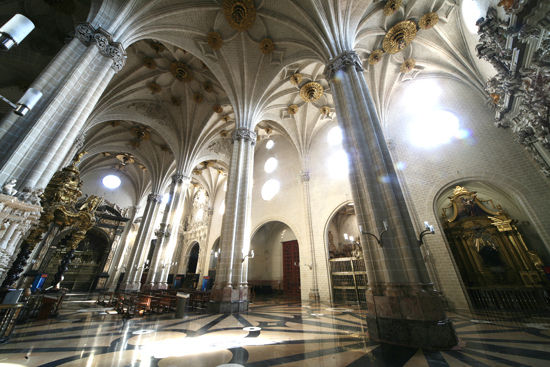 Both cathedrals in Zaragoza have been awarded world heritage status for architecture. As I’m writing this I’m at home listening to BBC Radio 4. I have encountered disastrous internet conditions in Spain so my narrative of events at the ‘coal face’ is one day late. The shipping forecast just before 1.00am is reminding me of the terrible weather the RLPO have encountered on our Spanish tour 2012. The only time the rain stopped for any length of time, after a brief glimpse of sun in Alicante, was as we were arriving at Madrid airport to come home again! 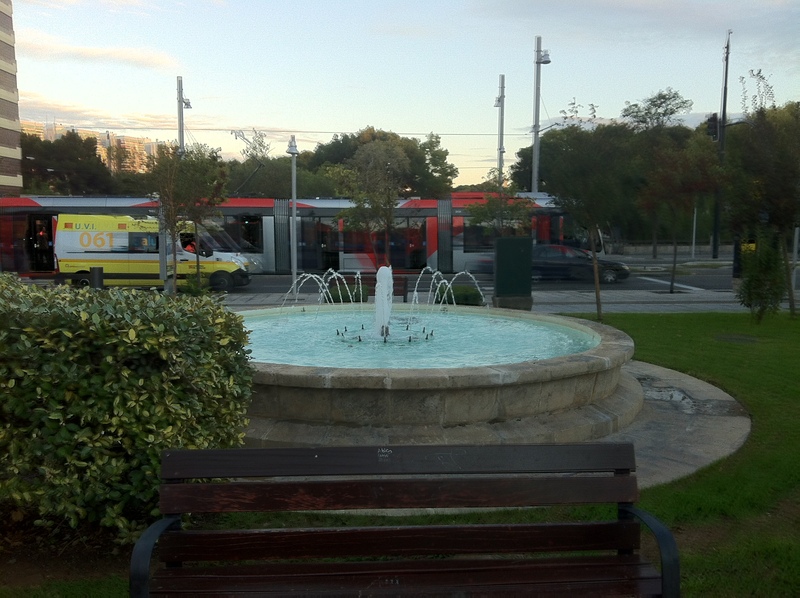 We managed to have another lie in this morning, with the coaches only leaving Pamplona for Zaragoza after 11.30am. Zaragoza is no strange city for the RLPO as we finished our Spain Tour 2006 there, in some style. Our music director at that time was Gerard Schwarz and that was the last concert of his tenure and I remember Richard Strauss’s Don Juan and Der Rosenkavalier very vividly. 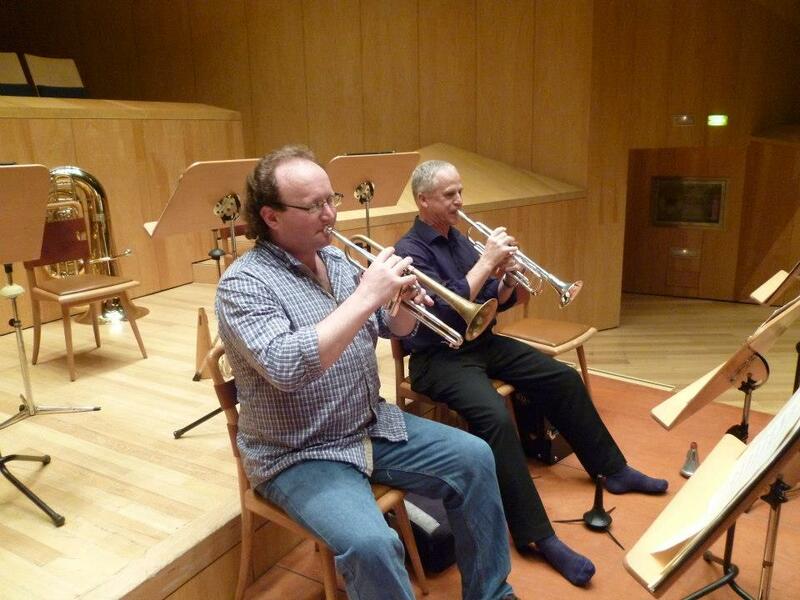 Schwarz had been a fellow trumpeter too. 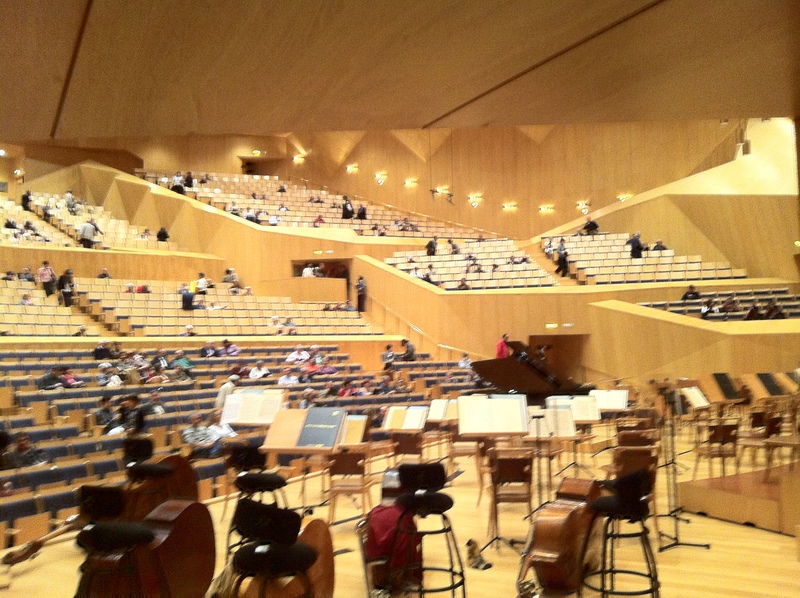 This was the fourth leg of the RLPO Spain Tour 2012 and the Auditorio Palacio de Congresso de Zaragoza is a spectacular hall, both to look at and to play in. The season of thirteen concerts looks quite prestigious, and we would be taking part alongside the Munich Philharmonic, amongst others. Palacio de Congresos de Zaragoza – photographed during another brief hiatus in the rainstorms! 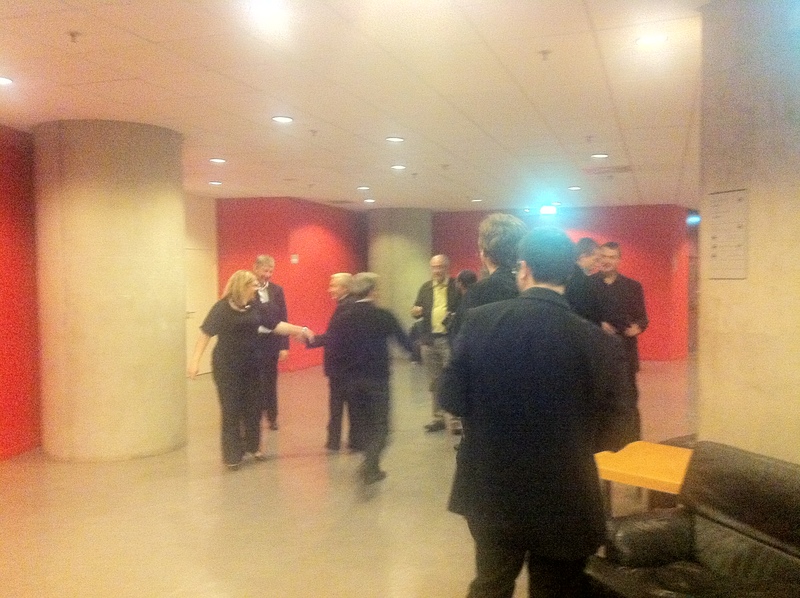 The Royal Liverpool Philharmonic arrived there at about 2.00pm to the spectacular 5 star Hotel Palafox. It was lovely. Spectacular bars etc. We didn’t eat there, however. 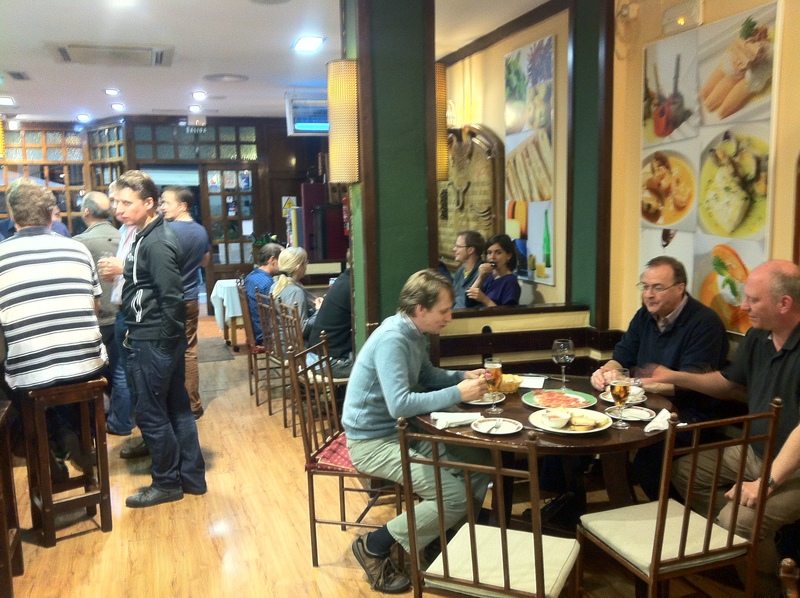 The hotel was situated right in the middle of Zaragoza’s fine eating and drinking quarter with many great restaurants to decide on. Some members dine in the hotels but I would say the majority of the RLPO tend to appreciate all those local bars which offer traditional fayre and a sense of experience that hotel chain restaurants can’t offer. We like the places of long standing in the streets slightly off the straight and narrow which offer fantastic local food and regional wines. Something just a bit different.We had a wander, walked past the obligatory Irish bar, to be found in every town abroad, and did indeed choose wisely. 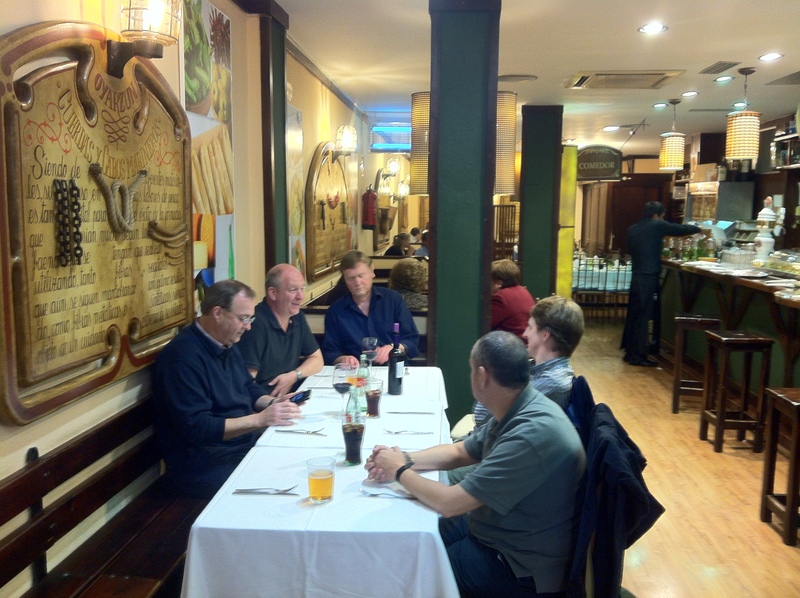 Lunch in Zaragoza – Dave Pigott Horn, John Hebbron Violin, Tim Jackson Horn & Chris Morley Horn. I’m not in the picture as I’m the photographer! I was quite amused to see that they play Bingo! 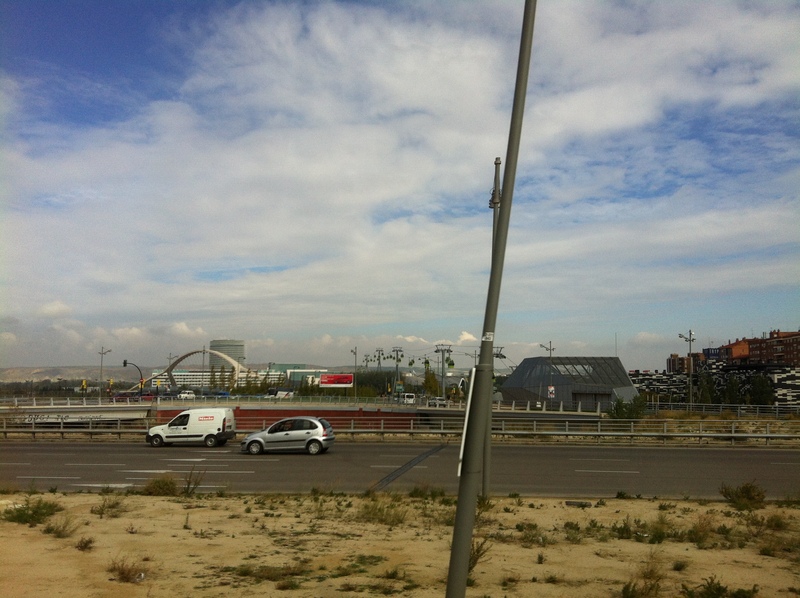 in Zaragoza. 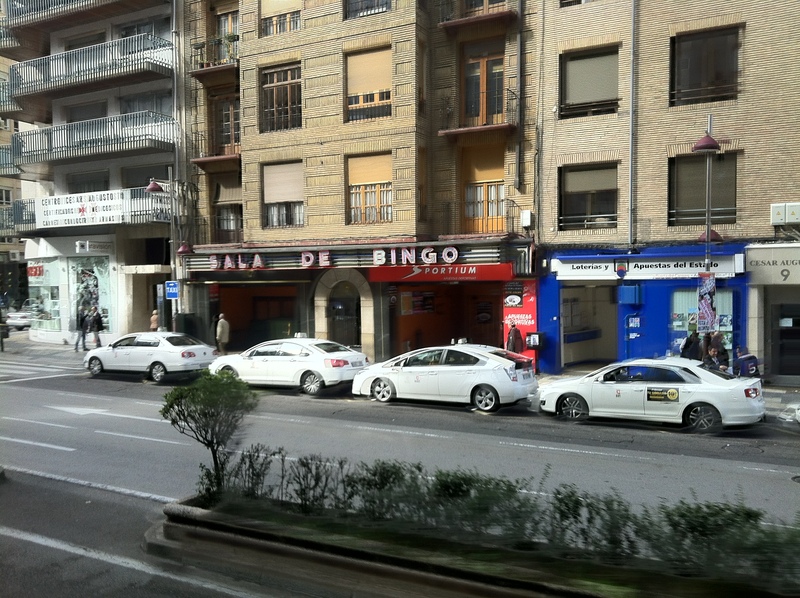 I have no idea why I should have an assumption that Bingo is a purely British pastime but I was also surprised to walk past the Rotary Club of Pamplona only yesterday, also. My Grandmother used to take me to Bingo when I was a kid and I still remember the ‘caller’ saying his rude rhymes etc when he called the numbers such as, “… All the 8’s, 88. Two fat ladies eeh bah gum, pull down your knickers and show us your bum!” Perhaps a little crude for on here but they still spring to mind when conductors call out rehearsal figures! The time came for our one hour rehearsal, and once again, only a gentle warm up and familiarity with the new acoustic was necessary. Tea time arrived and once again there was no shortage of nice places to eat and drink. The trumpet section found a nice little place by the hall. Paul and I were dressed in similar uniforms to the Basque Separatists as we were the only members of the heavy brass in the first half of the concert and would have to go back before the others. For this reason we also had to order some food before the others too. 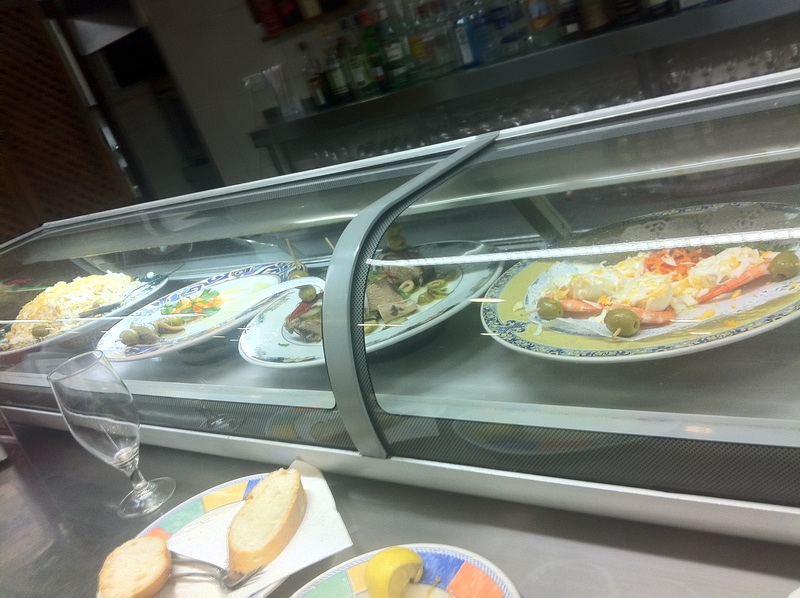 We found another bar, further down the road and ordered some superb tapas. For those who have been following the previous reports of our tour, you will know that the ladies of the RLPO went out last night to celebrate the Hen Night of 2nd violin Olga Muszynska. I can only assume that several ladies must become a tad tired and emotional as the celebrations proceeded. 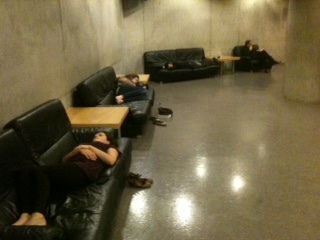 Just look at the lot of ’em here, in the concert hall, monopolising all the couches, having a preconcert rest! It was during our food in the bar that a well dressed gentleman came over and asked if we were from Liverpool. His English was immaculate and he had noticed that Paul and I were dressed ready to perform. The man said he was coming to the performance but had found it necessary to eat something first. He said he was looking forward to the Shostakovich played by the RLPO with Petrenko and wouldn’t have missed it from the world. 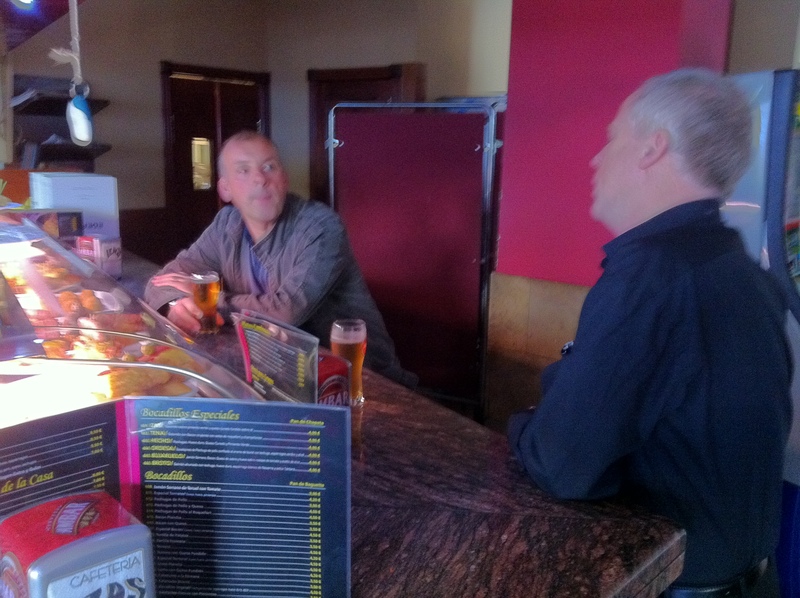 He said he lived in Zaragoza but had flown to Liverpool a few times previously to hear us. The concert here in 2006 had proved to be very popular and a sell out, so had great expectations that this would be the same this time around, especially as the RLPO is enjoying quite a high profile just now. This proved to be the case. Legendary Octagenarian concert pianist, Joaquin Achucarro about to take the stage in Zaragoza on the final performance of the RLPO Spain 2012 Tour being wished good luck by Becky Martin, orchestra manager for this tour.. Double click the photo to enlarge. 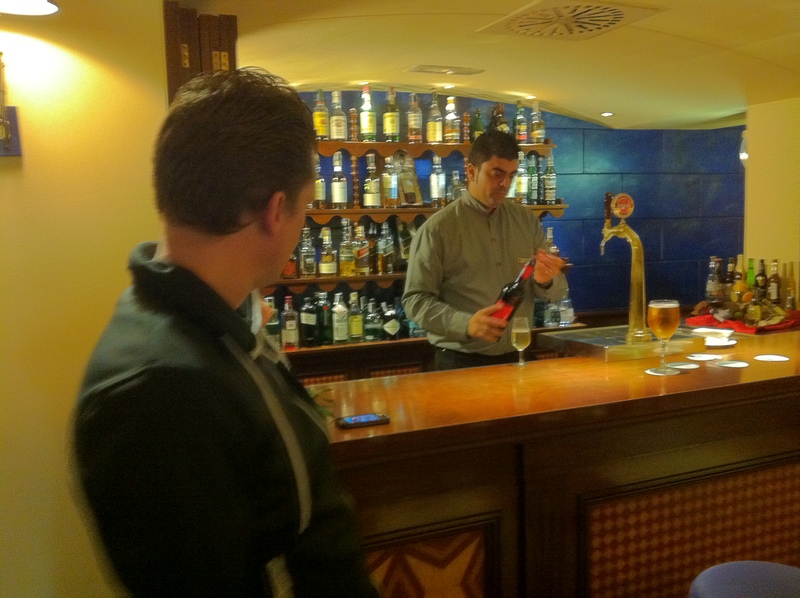 Afterwards it was straight back to the hotel on the coach for a celebratory drink in the hotel bar and lounge. 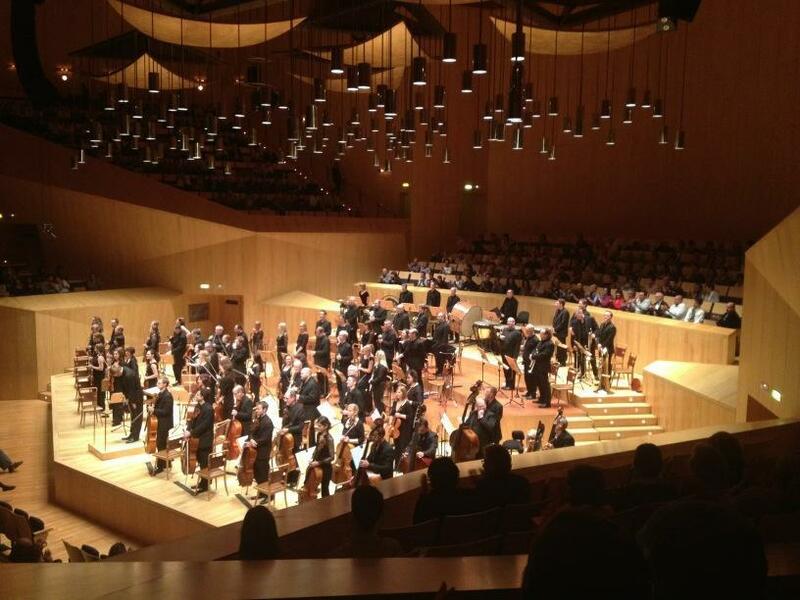 It had been another highly successful series of concerts on tour for the orchestra again. 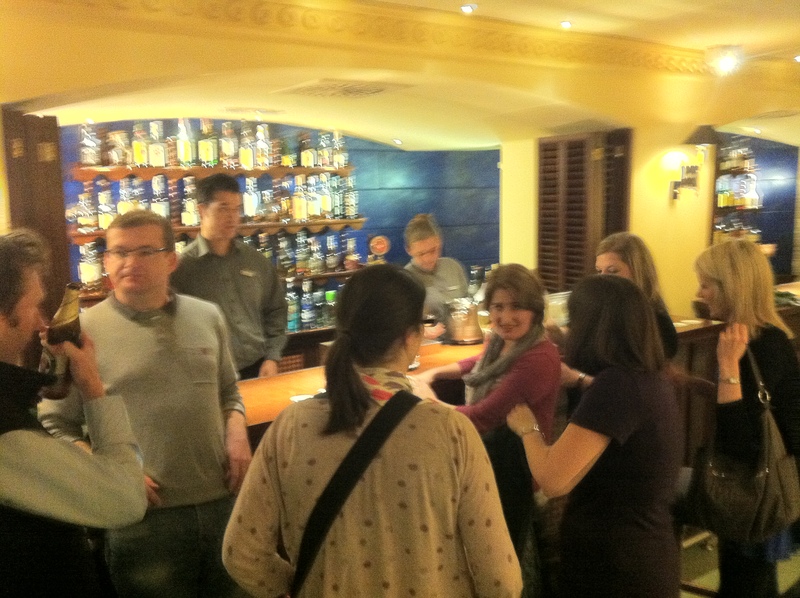 The place was buzzing with excitement and everyone out to enjoy the last night out in Spain. After a quick drink or two together the orchestra split up into it’s smaller groups to go to town for food and a couple of drinks. We returned to the excellent place we had our lunch in and many seemed to have had the same idea. The staff were delighted. It was jam packed, inside and out, full of the RLPO. 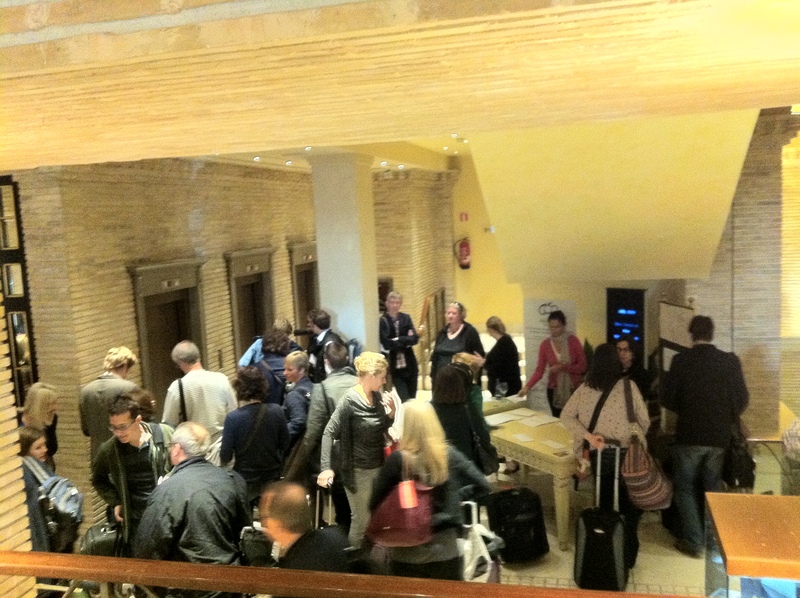 Links to RLPO Spain Tour 2010 can be found here! 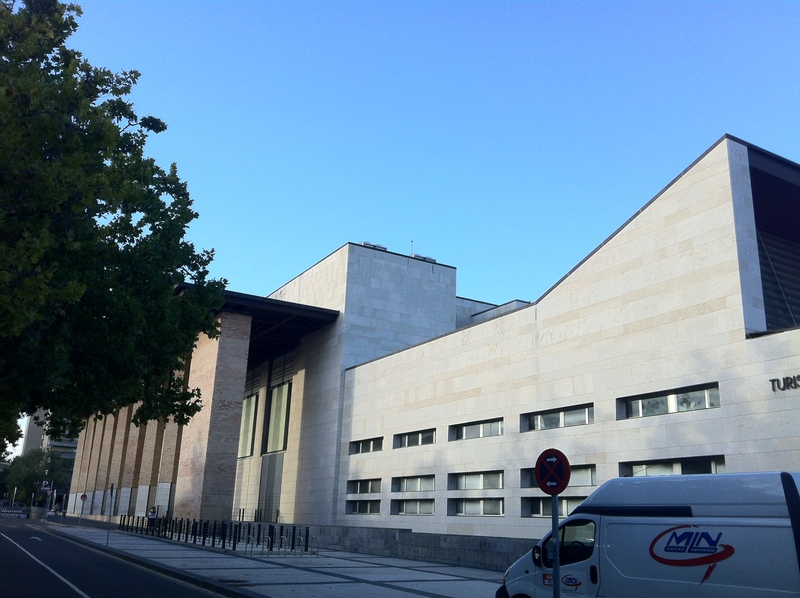 This entry was posted in About Brendan Ball, The Tour Blogs & Brendan's Solo Blogs and tagged "Royal Liverpool Philharmonic Orchestra", Auditorio Palacio de Congresso, Cathedral Pilar, Cathedral Seo, Gerard Schwarz, Handel Hone, Hotel Palafox, Joaquin Achucarro, Olga Muszynska, Paul Marsden, RLPO Spanish Tour 2012, Simon Cowen, Tommy Wagner, Zaragoza. Bookmark the permalink.